On Sunday, April 2nd, Autism Awareness Month begins with World Autism Awareness Day. The Presidential Commission on Persons with Disabilities will host an informational table at the Holmes Student Center on Monday, April 3rd from 11-1. 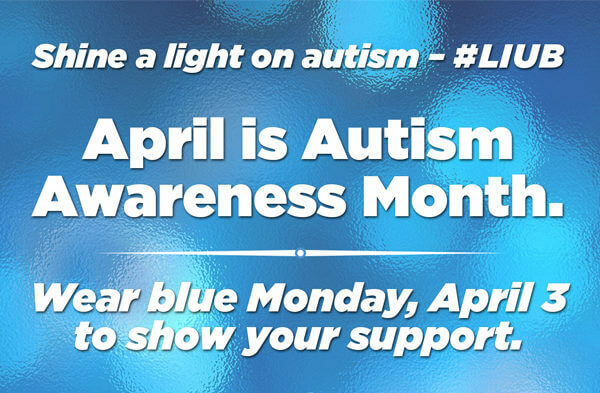 They are also asking individuals in our community to wear blue on Monday, April 3rd to help shine a light on autism. about autism. A UN Resolution explains the global support for this effort. Locally, a number of NIU students, staff, and faculty are touched by autism in their lives, both as individuals with autism or as family members or caregivers. NIU also supports research related to autism in several colleges, departments, and research groups. The goal of our autism awareness efforts is to support those efforts and to educate our community about autism.